Recently I was moving a shared hosting client from one of our older servers to a newer one because of some performance issues she was having given the resource needs of her site. I used CPanel’s Transfer Tool for this, and I wanted to quickly note how powerful it is. 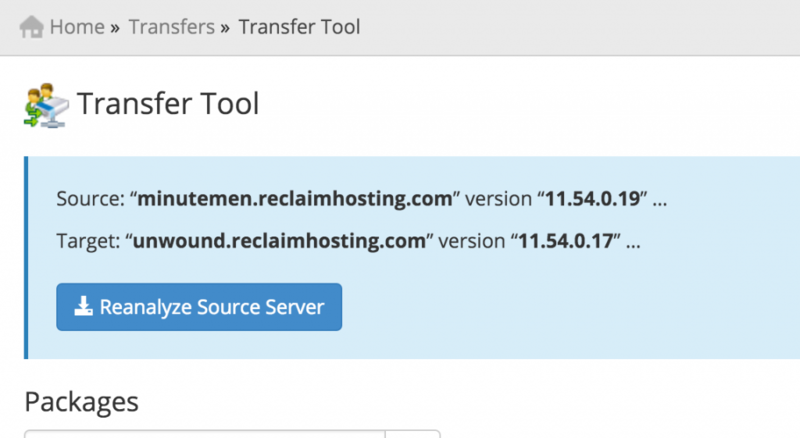 The Transfer Tool enables you to move an entire cPanel account from one server to another with a few clicks. 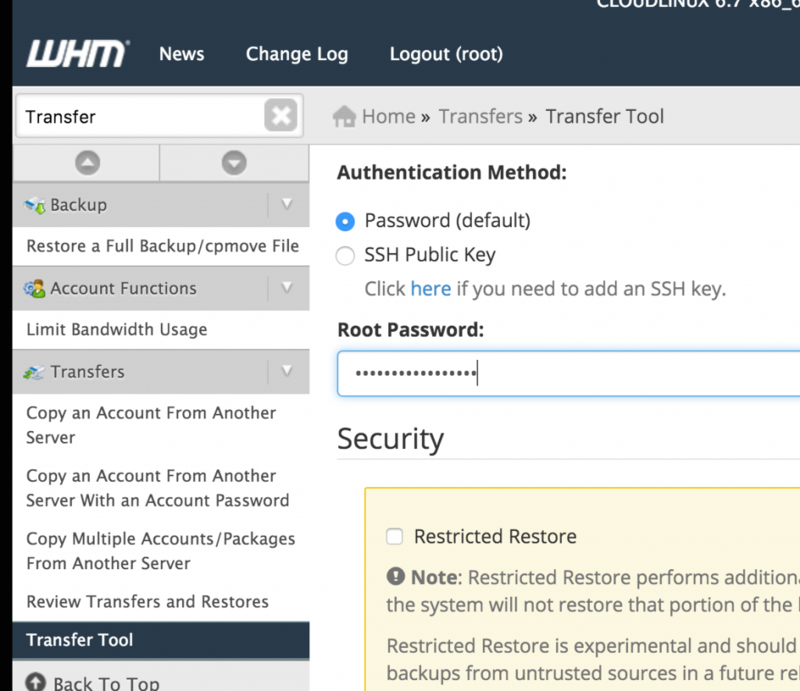 When migrating accounts from other hosting companies that use CPanel, we often use cPanel’s Restore a Full Backup tool (another clutch feature) because it allows us to move all the files, test to make sure everything works, and then point the DNS. 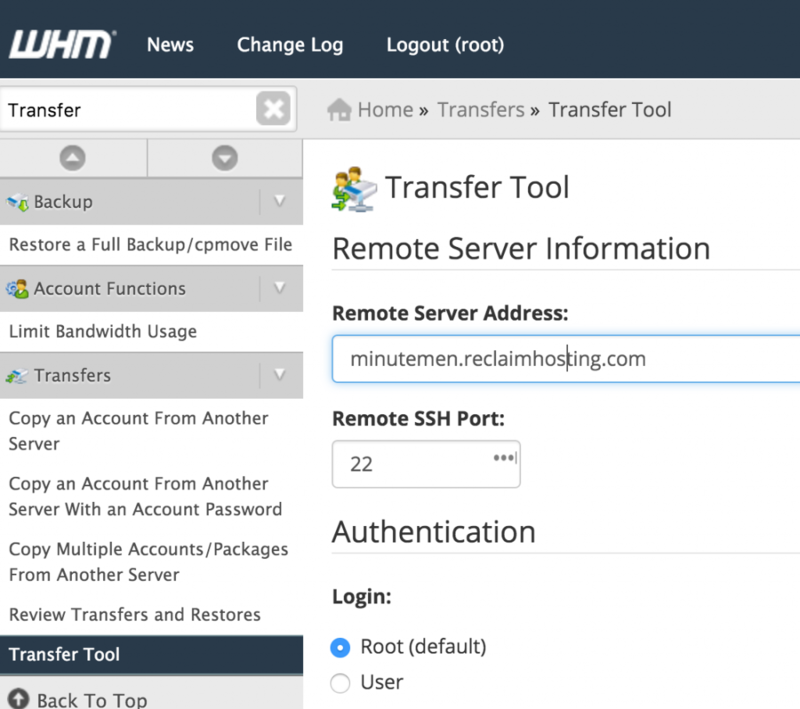 But when moving an account from one Reclaim Hosting server to another, we usually use the Transfer Tool. It’s simpler because both sites are within the same DNS Zone and we know our servers won’t block the request, which is not the case when pulling accounts from other hosting services. Finally, it is dead simple. As an example, I decided to move the venerable ds106 from the Minutemen server to the Unwound server for the sake of getting screenshots and narrating this post. You work from the server you are migrating the site to. So, in this case I logged into the Unwound server and searched for the Transfer Tool. You then add the details of the server you want to transfer the account from. For me, that would be minutemen.reclaimhosting.com. You add the password credentials, and make sure “Restricted Restore” remains unchecked. This might be useful for sites you believe are hacked or compromised, but often it leaves file out of the restore often breaking the site in the process. Once everything is set you click on the blue Fetch Account List button. After that, the transfer Tool will compare the versions of cPanel and let you know. You then get a list of all the packages, something you can also ignore. Next, the ability to search for the account you want to transfer. Leave everything checked but Express Transfer. Finally, click on the blue Copy button and let the Transfer Tool do it’s thing. The initial transfer will be very quick, but the processing can take some time. Don’t be concerned if the processor gets stuck around 23% for a while, this is normal. Just let the Transfer Tool do its thing. Once the account is both transferred and processed your site should now be live on the new server, in my case Unwound. I can now go back to the ds106 account on Minutemen and Terminate that account. Only thing to make sure of is that you check the option “Keep the DNS Zone” given all the Reclaim servers are managed by the same DNS Cluster. 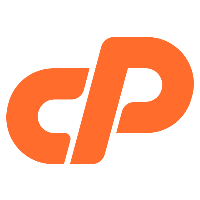 This entry was posted in reclaim and tagged cPanel, documentation, ds106, reclaim, Transfer Tool. Bookmark the permalink.